I am not by nature a city dweller, I much prefer rural life; however, it has been a real pleasure to return briefly to the city where I lived, and taught English, for several years in Romania. The city is Iasi , which is a major city in north east Romania with the country’s oldest University (the city’s name is pronounced ‘Yash’ – in Romanian the ‘s’ has a comma under it, rather like a cedilla, and so has the sound ‘sh’). 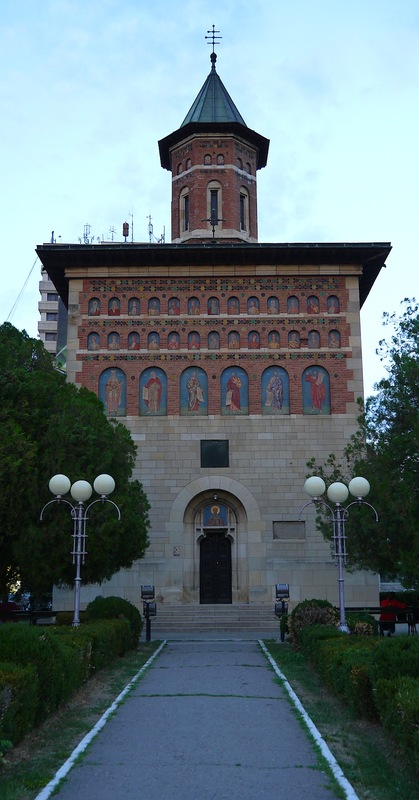 One of the pleasures of living in Iasi was that artistic culture was very much alive and to share in it cost very little, but the downside was that many of the facilities were very run down. Today, many of the buildings are being renovated, some almost complete. 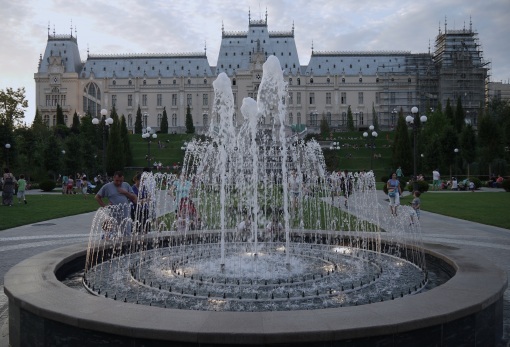 The building in the background in the picture above is ‘Palatul Culturii’ (The Palace of Culture), in fact a museum. 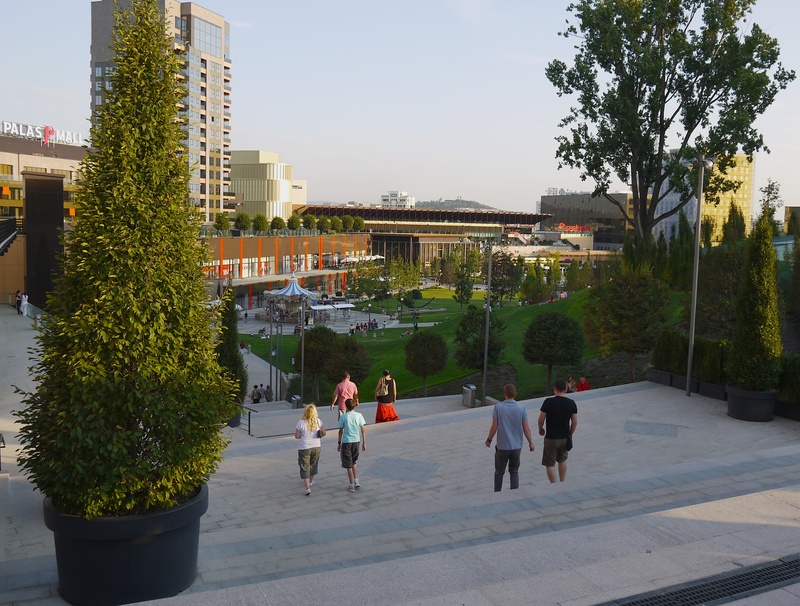 The Romanians cleverly allowed a developer to build an enormous shopping mall, together with a delightful park (pictured below), only on condition they undertook the renovation of the museum building, an enormous and incredibly costly project. It is now almost completed. 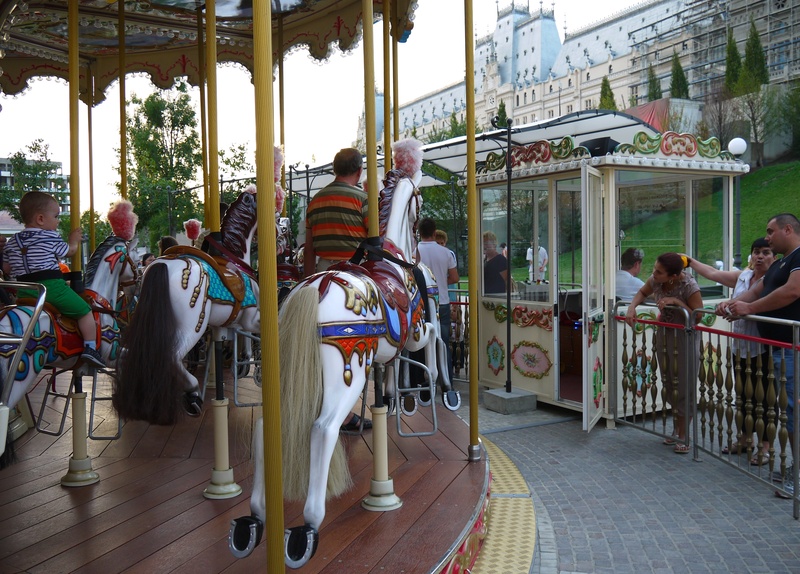 When I visited the park, complete with carousel, it was full of families with young children, courting couples, older couples, all looking happy and contented in a green and colourful environment despite the severe drought which has made much of Romania look like a desert. (When I left Romania in 2004, this area was also a desert of waste ground). Looking up through the pierced copper roof of a cupola on a lake in the park, seeing the ‘biscuits’ stamped out from the sky, prompted my ‘sky biscuits’ picture haiku, posted on 3 August. Nearby is the church of St. Nicholas, which was renovated some years ago. It is the church in which I was married in October 2000 and where I went on many Sundays to listen to the magnificent choir, at Easter, and at Christmas to hear the wonderful Romanian carols. The ‘Filarmonica’ (Concert hall) was almost a ruin when I went every week throughout the ‘season’, a season ticket costing less than £30 for more than 20 concerts! Every five years this included all the Beethoven string quartets performed over several weeks by a magnificent Iasi quartet, ‘Voces’, whose playing reminded me of the renowned ‘Amadeus’ quartet (I have vinyl LPs of the complete cycle played by them back in UK). Now the concert hall has been renovated and looks magnificent. In the foreground of the Filarmonica a poster advertises Shakespeare – A Midsummer Night’s Dream – outside the nearby ‘Teatru National’ (‘national’ theatre), a smaller version of the theatre in Vienna but just as magnificent now that it is almost completely renovated. Something which impressed me about Romanian high school pupils – 12 to 18 years old – when I lived here was that I could stop one at random in the street and ask them to quote me a line of Shakespeare and at least 9 in 10, probably 99 in 100, would do it flawlessly, often not one of the most quoted passages. What would the proportion be in the UK? I doubt better than 1 in a 100, if that. Another banner across the whole street outside the theatre advertises opera (and I do not have to remind opera lovers that one of the world’s leading ‘divas’ now – Angela Gheorghiu – is Romanian). 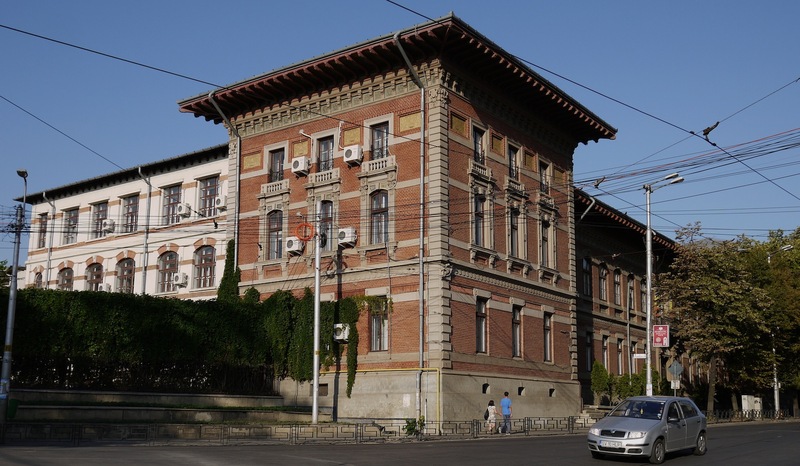 Talking of pupils, below is a picture of one of the three high schools at which I taught English in Iasi – Colegiul National, which was founded in 1826 and remains one of the top two high schools in the city. It was becoming twilight when I reached Piata Unirii (Unity Square), which celebrates the unification of the different regions to become Romania in 1859 (Transilvania became a part of Romania in 1918). 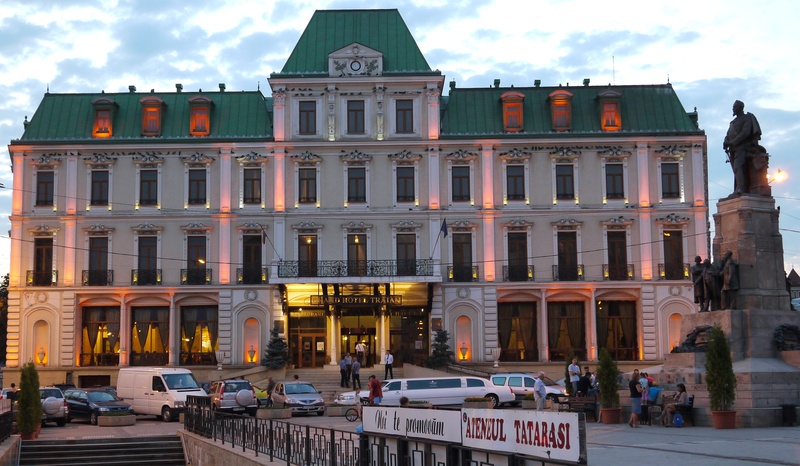 Dominating the square is another magnificent building – the Hotel Traian. 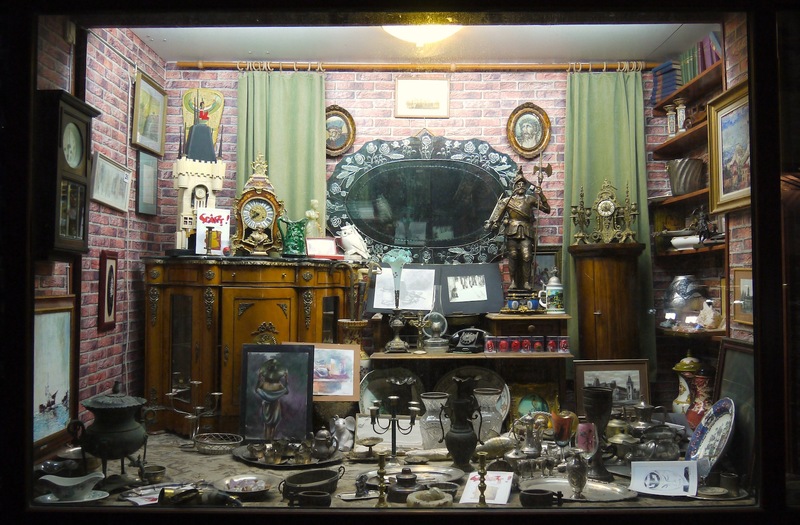 Nearly back to my Romanian wife’s family flat, I passed by what was the only antique shop in Iasi when I lived here – in what was in the distant past the city’s main street – Str. Lapusneanu. A model galleon in full sail sits in our living room back in the UK; I bought it in this shop, which lights up the wares in its window in the evening. 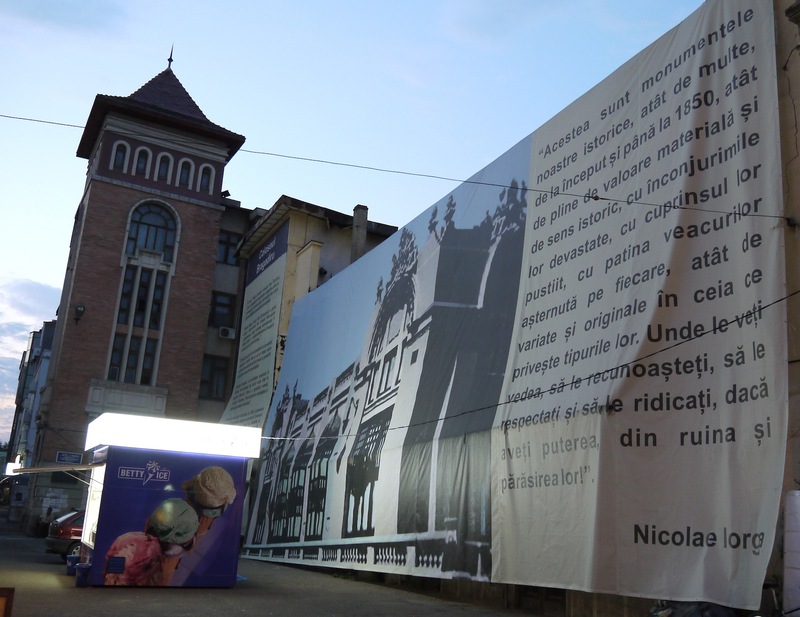 Buildings in this street are now being renovated and a gigantic protective cover reminds the people of Iasi what they have and need to protect, as said to them by one of the country’s most renowned historians, Nicolae Iorga, a superb writer, who was assassinated by fascists in 1940. “These are our historic monuments, so many, from the beginning until 1850, so full of value both materially and in an historic sense, with their surroundings devasted, with everything destroyed, with the patina of age covering each, so varied and original in which is seen what they were. Where you see it, recognise it, respect it and raise them up, if you have the strength, from the ruin and disappearance”. (My translation, not perfect but hopefully adequate). Nicolae Iorga, 1871-1940. It’s taken a long time but the rebirth has begun. For more stories and experiences in Europe, check out Surfing in Portugal with Baleal Surf Camp, 5 Less Popular Cities Worth Visiting in Germany‏, and Art. Boutique. Unique. Harmonie Vienna..